This Tiny City Has a Great Big Monster of a Stair Race! 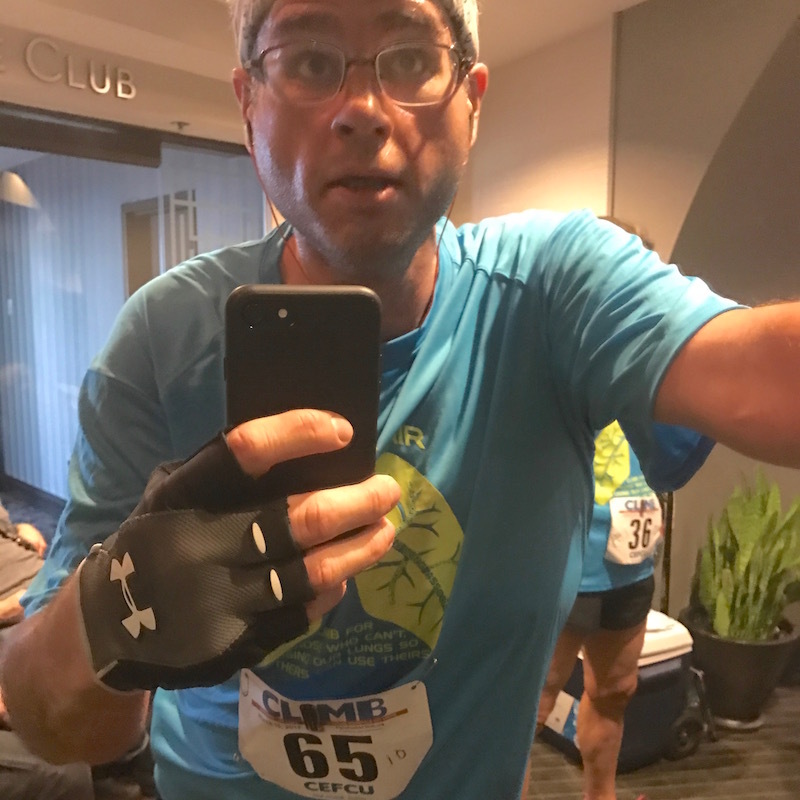 (Climb Wyndham Race Recap) | Keep It Up, David! 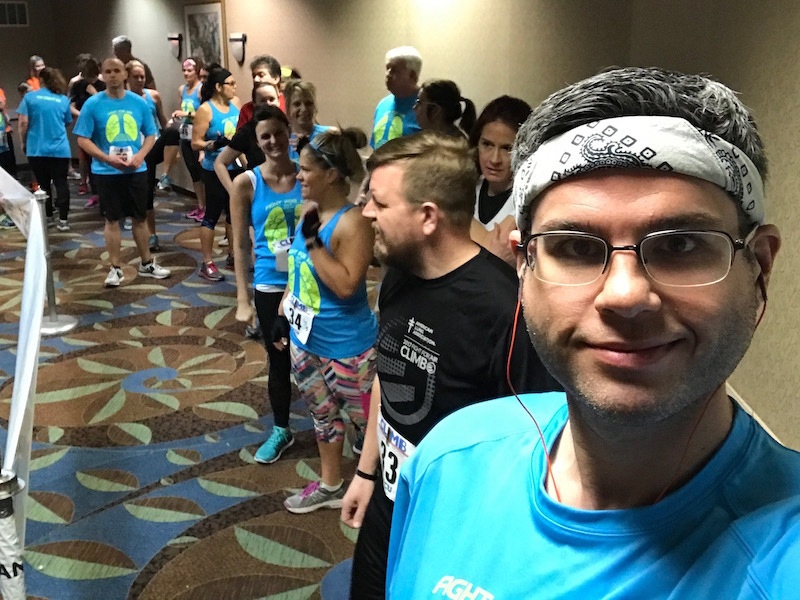 The race was Climb Wyndham, the Fight For Air Climb put on by the American Lung Association of Illinois. You might think an Illinois-based stair climb would be in Chicago, which is quite literally the birthplace of the skyscraper. But you’d be wrong: this race was in Springfield. With 117,000 residents, Springfield is the smallest city I’ve ever raced in, but this race is no joke. 850 people registered for this event – making it larger than many races I’ve done in cities 10 or 20 times the size. 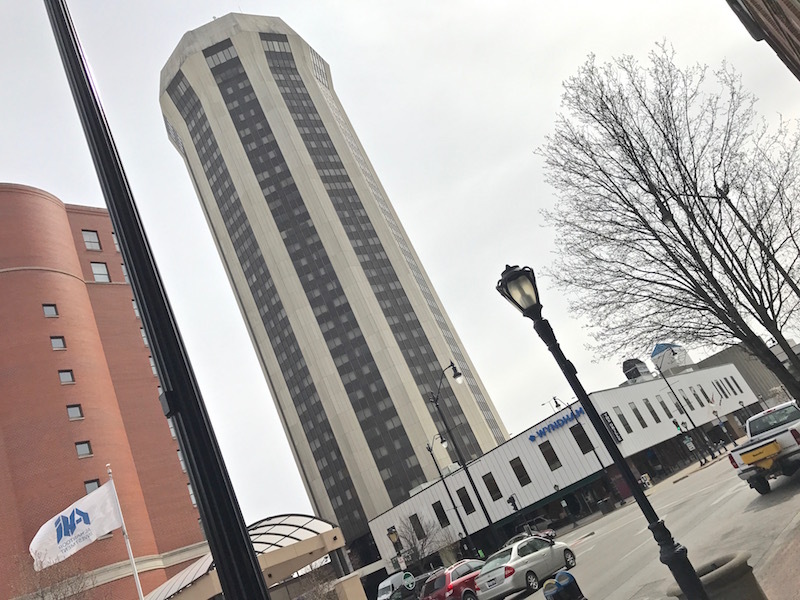 There’s one building in town tall enough to attract racers from across the country: the Wyndham Springfield City Centre hotel. With 30 stories, it’s the tallest building in Illinois, excluding the Chicagoland area. Even though it might be dwarfed by some of the enormous buildings I’ve climbed (Like Willis Tower or 1 World Trade Center), the Wyndham is still pretty imposing, probably because it’s two or three times taller than anything around it. 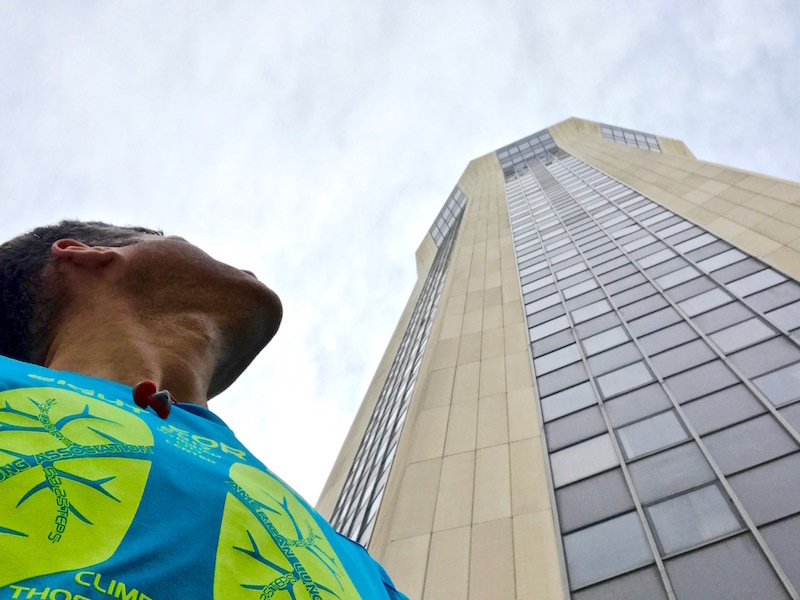 This race, like the Minneapolis race I did two weekends ago, has an Ultimate Climb option, where you see how many times you can climb the building in one hour (stairs up, elevator down). Only 70 people are allowed to do the Ultimate Climb, and it sells out within days. That’s info that I was unaware of, so I sat on a waiting list for months, and it wasn’t until two weeks ago that I learned a spot had opened up for me. I was in Chicago when I got the call, a day or two after the Hustle Up The Hancock race, and I screamed for joy when I heard the news. After I hung up, my sister said, calmly, “You’re the only person I know who would get that excited to be able to climb stairs for an hour straight. You’re a glutton for punishment!” And… she’s right! This race started in the basement, and the Ultimate Climbers were divided into two groups. I was in the slower group, but I positioned myself so I was near the front of that line. I get nervous before races, and this day was no exception. I kept reminding myself that I had an advantage: even though this was my first time racing here, I’m familiar with the stairwell. 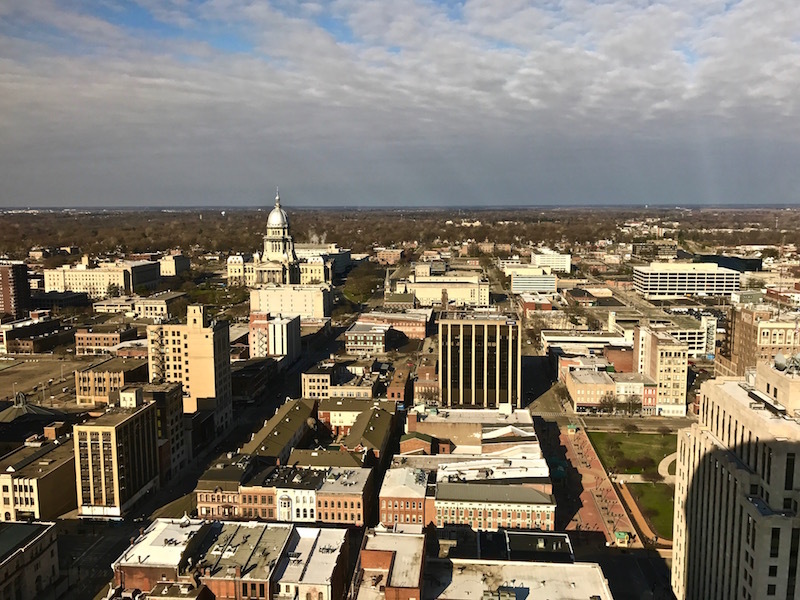 My aunt and uncle live in Springfield, and during a visit a couple years ago, we went to the restaurant on the 30th floor. They took the elevator… but I took the stairs, just for fun. The stairwell is pretty unique. There’s one landing between floors, but you don’t turn, like in most stairwells, you keep going straight. Because of this, there’s fewer turns, and that’s a good thing. As you can see, there’s a solid wall on both sides, which makes it harder to pass, because you can’t see people on the flights ahead or behind you. While there’s only a railing on one side, the stairs are narrow enough that I could still brace myself against the other wall if I needed to. A vast majority of the participants were doing the one-time climb (which started later in the morning), and all the Ultimate Climbers’ times for their first climb were going to be folded in and ranked alongside the one-time climbers’ times. That meant I had two objectives when I started my race: I had to simultaneously push myself to get a good time on my first climb, while not depleting all my energy. 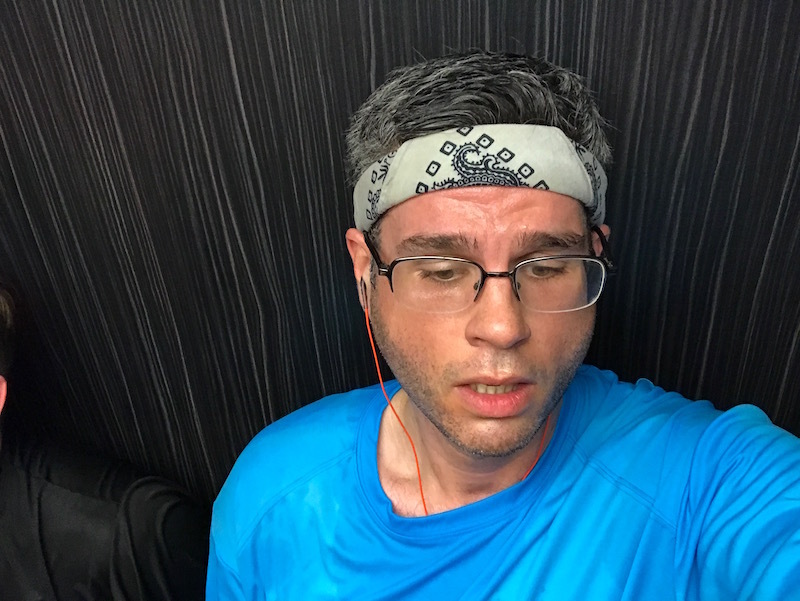 It’s hard to both push yourself and issue restraint in the stairwell, so I tried to start a little slower than usual and then keep a strong, steady, aggressive pace for that first climb. The strategy worked, and before I knew it, I was at the top, chugging a little cup of water, and waiting for the elevator. There was an ominous sign during my second climb: I started getting a muscle cramp on my right side. I didn’t let it slow me down. I honestly don’t know if I successfully pushed my way through the pain, or if the rest of my muscles caught up. Because that’s the thing with stair racing: It’s hard. Really hard. By my fourth climb, everything was hurting: my calves, my lungs, and everything in between. By my fifth and sixth climb, I found myself starting to stumble from exhaustion. My toes caught on the lip of a stair, twice, tripping me – but I managed to avoid, both times, a full wipeout). I found myself grasping for the handrail and missing it completely, and literally ricocheting off the walls when I turned, like a bumper car. All the discomfort from my searing lungs, my burning legs, my pounding heart, and my eyes, stinging from sweat, swirled together, amplifying each other, creating a tornado of pain that spun faster with every step. I was near my breaking point when a voice broke through the noise, silencing the agony. The voice was in my own head, and it was a reminder of the things I’ve done, all the training and discipline and hard work that brought me here. Then I reminded myself of all the things I was doing right then, in that moment, in that stairwell. I reminded myself that I’m strong – stronger than I give myself credit for – and that I’m all kinds of powerful, and that I’m capable of persevering, like I did during my hour-long races in Minneapolis and Denver, and the two-hour race I’ve done in San Diego (twice!). I don’t know if it’s physically possible, with six 30-story climbs already under my belt, to gain a spring in my step, but that’s what it felt like, and it was totally invigorating. I don’t look invigorated in this elevator selfie, but trust me, I AM! That internal pep talk came at the right moment. I glanced at my watch after the sixth climb, and I had 12 minutes left. I arrived in Springfield feeling confident that I could muster seven climbs in this building, based on my Minneapolis performance, but now I was faced with the opportunity to squeak in an eighth, and I didn’t travel 2,000 miles to throw in the towel early! 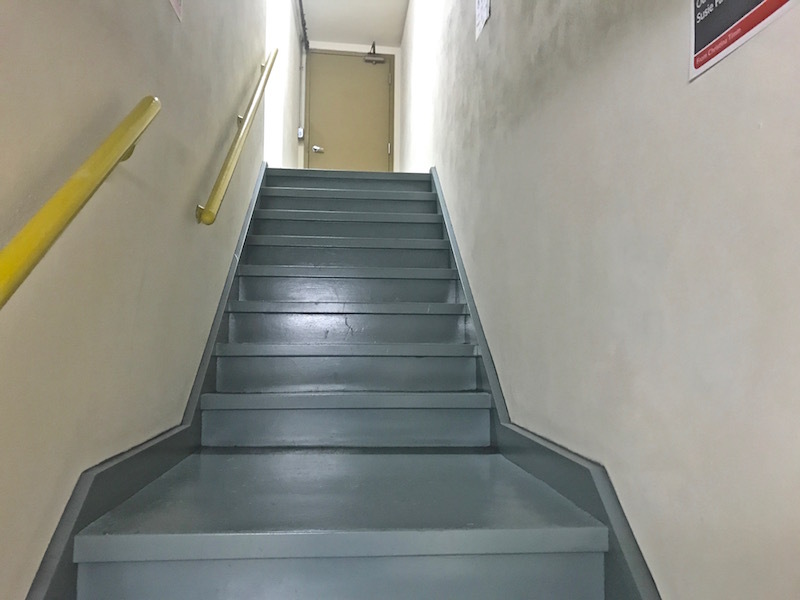 The seventh climb became my most urgent climb, because I had to finish it, take the elevator back down, and enter the stairwell before my hour was up. Then, and only then, would the eighth climb count. Despite my renewed sense of purpose, I found it extraordinarily difficult, due to sheer fatigue, to put any pep in my step on that seventh climb. But I stayed positive, and always kept moving forward, and exited the stairwell with less than four minutes left. I ran from the elevator back around to the stairwell, and started my eighth climb with less than two minutes left. I MADE IT! 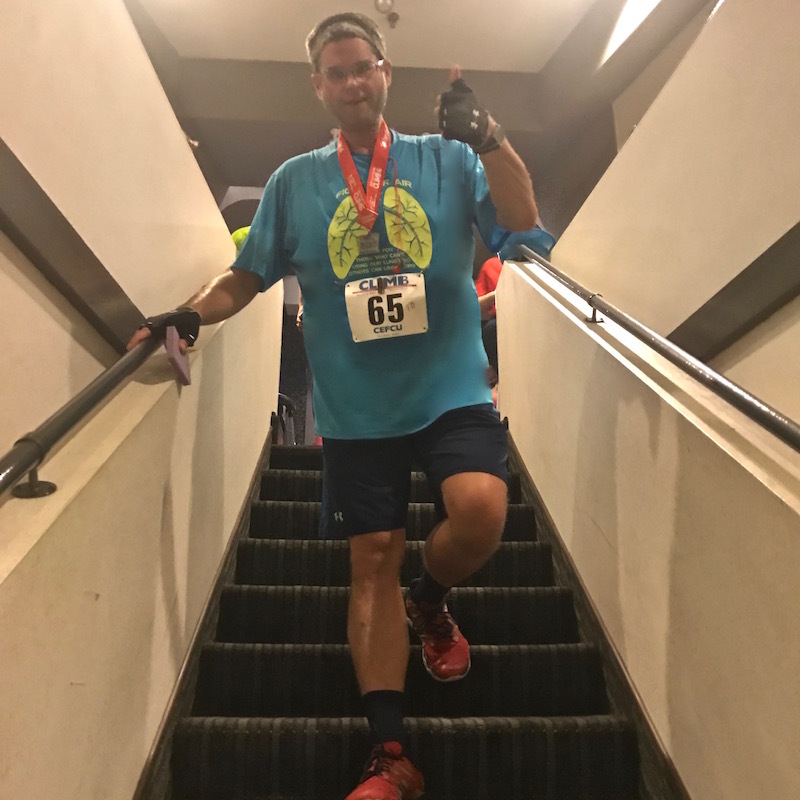 That eighth climb was celebratory, but I wanted to finish strong, so I celebrated mentally, while continuing to give the stairs everything I had. 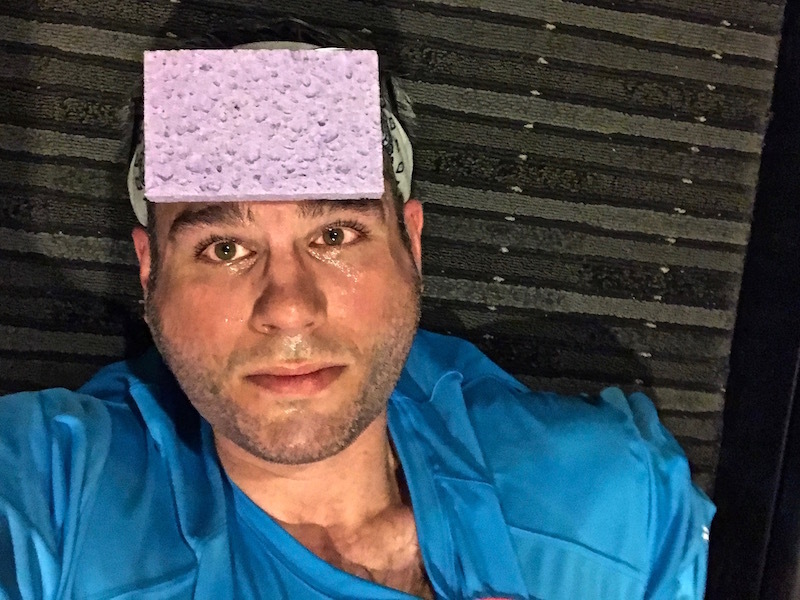 Before long, I stumbled onto the 30th floor for the final time, found a spot to lie down, and after an hour of excruciating physical activity, gave my feet a rest. That brings us back to the photo at the start of this blog. Wanna see a picture of me lying down after the race from another angle? CHECK OUT THE LOCAL PAPER! A photographer from The State Journal-Register snapped a bunch of pictures, and one was included in the article about the event. Check it out here. How cool is that? From there we could head down one floor to a conference room with tons of windows. There’s nothing more daunting, after a strenuous stair race, than having to descend a flight of stairs. I’ve never felt so weak-kneed and wobbly! The view from up there was gorgeous – it was a beautiful day. The domed building is the Illinois Capitol Building. Always proud to collect a finisher’s medal! First Climb: 4:51 – 30 stories in under five minutes! I’m very impressed with the consistency of my 2nd-8th climbs: they’re all within the same 21-second range, and four of them are faster than the climb that preceded it! My average heart rate for that 1:05:00, including all those two-minute breaks, was 161. My max heart rate was 175. Of the 66 Ultimate Climbers, I finished 30th. My first climb time of 4:51 put me 114th out of 664 finishers – whoa, 82nd percentile! I was also 20th out of 62 in my division (Men 30-39), and 89th out of 254 men. And then there’s this: 8 climbs x 30 stories per climb = I climbed 240 stories during this race. Two hundred and forty! IN ONE HOUR! I hugged her in person, but I’m sending a huge virtual hug to my friend Karen, a local who invited me to join her team for this race, and walked me through the waiting list process. 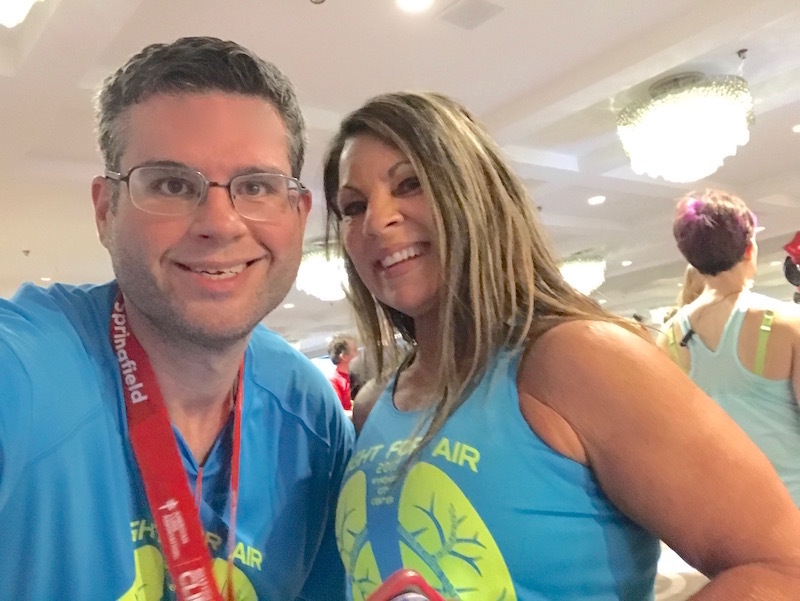 Teams are mostly for social and fundraising purposes, and Karen’s team – Team Geninatti Gym, named after the gym she owns – is the largest in the country for an American Lung Association climb, with 128 climbers at this event. She’s an absolute joy to hang out with, and everyone I met on the team was friendly and supportive, which speaks tons about Karen and how well-liked and regarded she is in the community. I’ve known Karen for almost four years, and I’m not surprised at all! 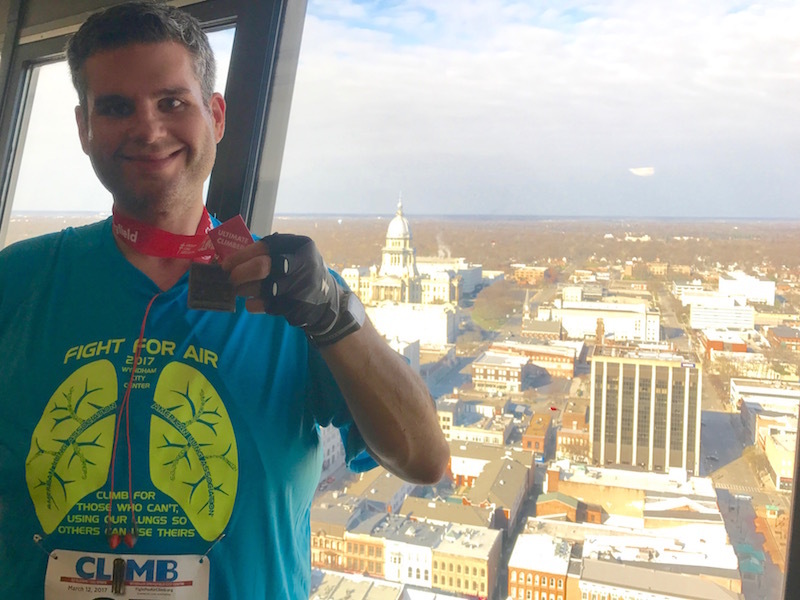 Huge thanks to my super-duper donors who generously opened their wallets for the American Lung Association so that I could participate in this event. I am very grateful to the Kolbs, Dana, Ann, Joanne and Joe, and Amy – they’re all rock stars! Lastly, a ginormously huge thanks to my friends at Bowflex, who sponsored me, helping to cover travel and registration costs. 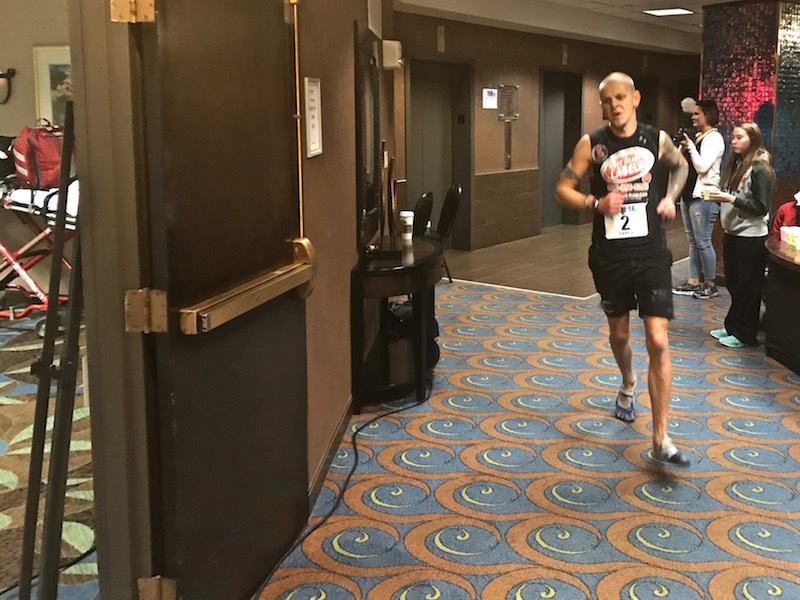 I use my Bowflex products all the time – I have a Max Trainer and SelectTech dumbbells – because they are stellar products that help me get ready for events like this. Check ’em out! This entry was posted on Sunday, March 12th, 2017 at 11:36 pm and is filed under Uncategorized. You can follow any responses to this entry through the RSS 2.0 feed. You can leave a response, or trackback from your own site. I’m a frequent reader, but I seldom comment…but it is exciting to see you back in my part of the country. I live about 60 miles from Springfield and would like to do this event one year. This year didn’t work because I was already registered to participate in the St. Patrick’s Day Parade Run (5 miles) in St. Louis. Maybe next year! You inspire me to want to try a stair climb. I don’t think I’m ready to leap into stair racing, but I’d like to try it at least once. Great job on your performance and I hope you enjoyed your stay in this area! Thank you for the lovely note, Angie, and hope the run in St. Louis went well! If you can handle that, you can definitely handle a stair climb. Oh – and check out my new post for more of my adventures in your neck of the woods! Another great performance by KIU Man! Way to go, David! Excellent consistency after an all-out 1st lap! Wow! Thank you George! Appreciate it.